Shalom, parents! Click here to sign into your CampMinder account. Click here for the 2018 Family Handbook. Click here for the JFD Swim Program Progression Summary to keep in touch with your child’s swimming progress. The Ramah community exists year-round. 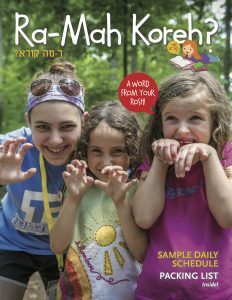 We hope that all returning parents will like us on facebook, to keep up with all the current news and photos from Camp Ramah and the Ramah community year-round. Visit our blog during the year and throughout the summer to keep up-to-date with all the fun things happening at camp all year long.